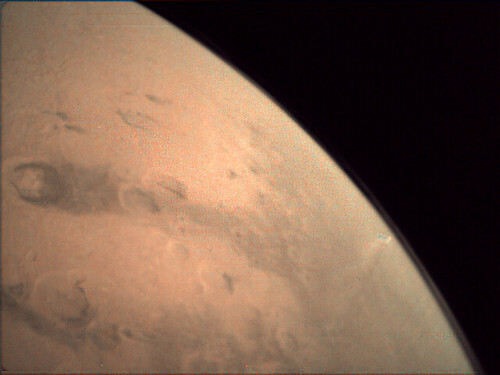 Quick update received on 11 March from Mars Express operations engineer Andy Johnstone - Ed. On 7 March, we were scheduled to perform a MELACOM pass with NASA's MSL; this involves us passing over Gale Crater with our MELACOM UHF antenna pointed towards the rover. NASA later chose not to use our pass, so we decided to use it to perform a VMC observation instead. The images we took were then stitched together to form a short video where Gale Crater can be seen as the dark horseshoe shape midway up the left hand side of the screen. This offset is due to VMC being set at 19 degrees from MELACOM.